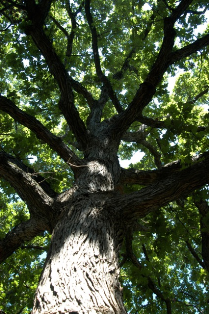 The now famous bur oak in Waco, Texas. 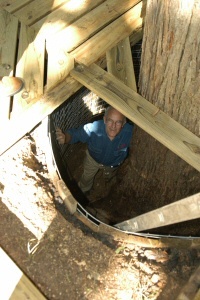 Owner Terry Hobbs is down in the hole that was created by removing almost 10 feet of fill from the trunk of the tree. 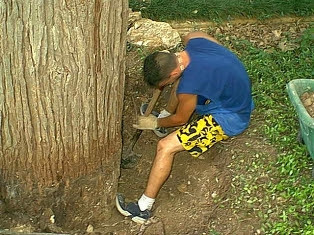 It looks as if the beautiful tree will make it. 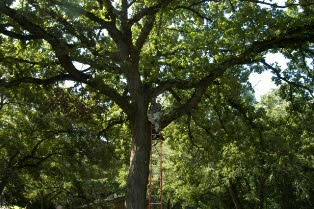 One of my most interesting radio show calls came from Terry Hobbs in Waco, Texas. Our conversation on the air led to one of the most interesting trunk flare exposure projects ever. Here’s the story in Terry’s words followed by a photographic review of the successful project. 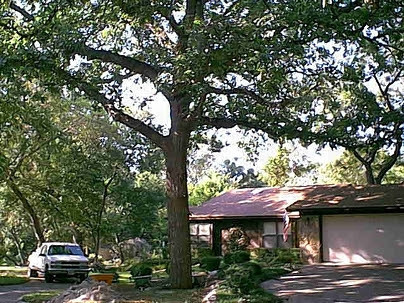 We became concerned about the lack of leaves on my bur oak tree, which was estimated to be about 150 years old in the late 1990's. 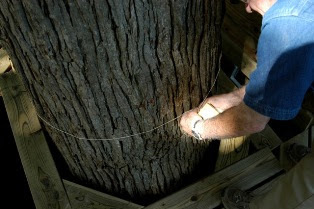 My wife called a local tree man and he came out and injected some chemicals into the base of the tree. It didn't seem to change the quality of the tree at all. We were already following the Dirt Doctor and treating our yard with the organic materials. 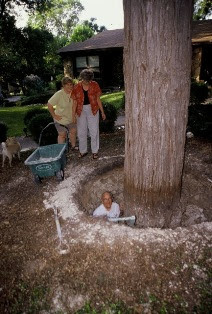 It was about 2003 when we learned about the need to keep for your tree flares exposed. 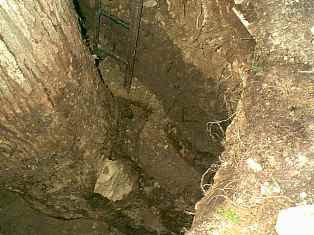 So we began digging. 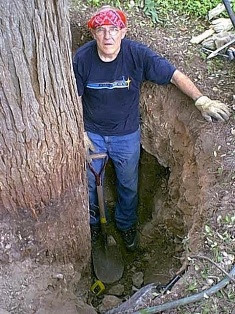 When we got to 2 1/2 feet I decided to call the Dirt Doctor to see how far to dig. 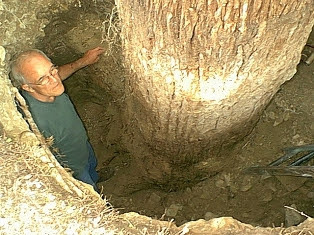 He said keep digging; there was a tree flare somewhere. At that time I decided to hire a young man to help. We continued to dig. 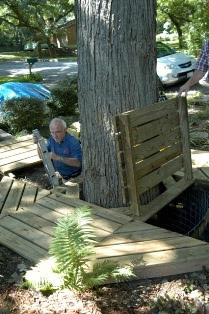 The tree had originally been on a creek bank that was replaced by a large culvert and covered over. At 4.5 feet we uncovered the first flare. The next flare was uncovered at about 9 feet. 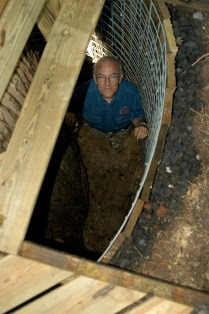 An attached picture shows the barrel I constructed as a retainer wall to prevent the wall caving in. 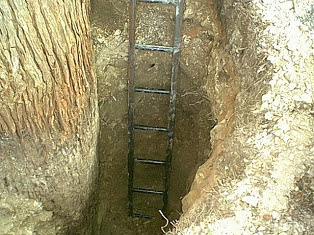 The work has been successful because the tree's condition has improved and the circumference has increased from 104 to 111 inches.